What exactly will the legal fight look like? 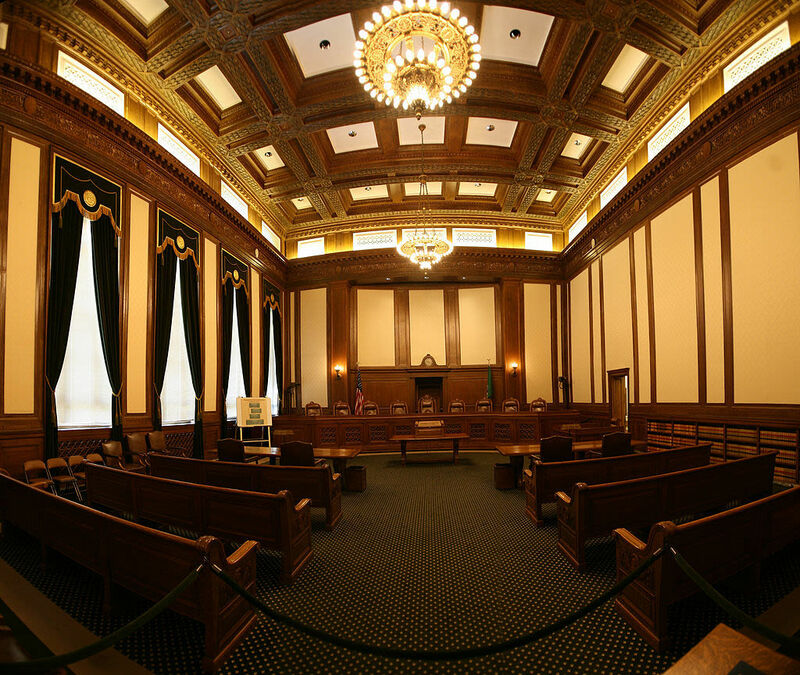 The interior of the Washington State Supreme Court in June 2007. The push for a city income tax is moving along quickly. Since former mayor Mike McGinn urged the city council to pass the tax entering the mayoral race on April 17, mayor Ed Murray followed suit less than a week later. By Monday council member Lisa Herbold, who took the reins on the legislation, set the goal of passing it by July 10. The majority of council members have since publicly supported the push for the progressive tax—Bruce Harrell, Lisa Herbold, Rob Johnson, Mike O'Brien, and Kshama Sawant (who's pushed for an income tax for years). What exactly will the legal fight look like? Bob Mahon, an attorney who owns a state and local tax practice, said it's going to be a challenge. Here's why. 1. There's a possibility the legislation might not make it to the state Supreme Court. Mahon says he believes it will, because the Supreme Court likely will take a special interest in the income tax issue. It's been a long time since the court's precedent in the 1930s, and judges "would view it as significant statewide importance." That said, Supreme Court judges are not obligated to take the case, and there's a process before it reaches that level of legal scrutiny. After the council passes the ordinance, an organization or taxpayer is expected to file a lawsuit, likely in the King County Superior Court. (At times the challenger can decide which court to file it in, but Mahon says there's not much basis for filing a lawsuit outside the county.) That decision could be quick; the city has a right to appeal to the Court of Appeals, but not a right to appeal to the state Supreme Court. 2. It's not the state Supreme Court's decision in the 1930s that's the biggest hurdle—it's the state legislature's decision in 1984. RCW 36.65.030 states: "A county, city, or city-county shall not levy a tax on net income." "There's a general principle that the court will avoid reaching constitutional issues if it can," Mahon said. "It will try to resolve cases on statutory grounds." That means that before the state Supreme Court will reconsider their decision made in the 1930s, they'll try to decide whether state law allows the income tax. Even before this statute got on the books in 1984, Mahon said, there was no explicit state law that affirms cities have the authority to create a local income tax. They'll have to move past that argument to reverse the court's decision in 1933, when judges ruled an income tax unconstitutional. 3. The RCW specifies a ban on "net income." The challenge, then, is to "craft a narrow enough tax on income," Mahon said—like, for example, a capital gains tax. Mahon said an adjusted gross income, which is what Trump-Proof Seattle is asking for, would be a stretch. 4. The state legislature can't change that statute—at least, not with Republicans holding the majority in the Senate. There have been several attempts to create an income tax among lawmakers, including by Democratic state senator David Frockt of Seattle. They have never gotten very far. -The line banning a net income tax was slipped into a chapter on city-county governments, which relates to the combined "city-county" form of government. It's irrelevant to the chapter, which makes it unconstitutional. "The state constitution prohibits this kind of logrolling," she wrote in an email on Wednesday. -The RCW doesn't define the term net income. Without definitions, the clause is meaningless. -Regardless, she argues that adjusted gross income is fundamentally different from net income. And "by establishing a threshold for taxation only in excess of $250,000, Trump-Proof Seattle leaves the vast majority of income completely untaxed," she wrote. Updated April 26, 2017, at 6:05pm. This post contains new arguments from an attorney for the coalition.